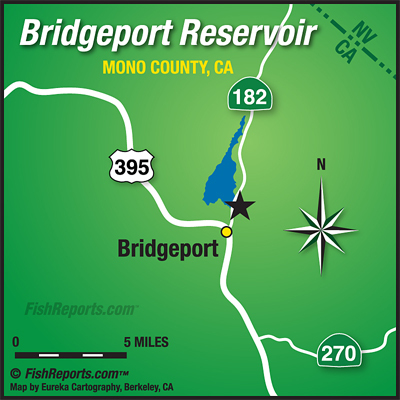 Bridgeport has still been kicking out lots of fish in the 2 to 6 pound range, both trolling and bait fishing from boats. The shore fishing hasn’t livened up just yet but when it gets colder hopefully that will change. The trolling has been good with small rapalas, needlefish, crawlers and thomas bouyants while the bait anglers have been doing well over in the Rainbow Point area with inflated crawlers, pinched crawlers, mice tails and power bait. We heard about a couple fly anglers doing well up in the East Walker channel as well as the Buckeye/Robinson channels stripping streamers, we heard they didn’t catch huge numbers of fish but that they got into some good browns in the 5 and 6 pound class. The water clarity is not good, as usual, out there but if you get your trolling gear just 10 or 12 feet below the surface and under the algae you should be able to get into some good fish.